A new market place is born! 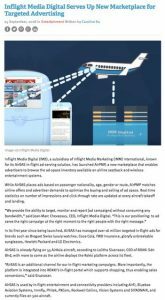 IMD (Inflight Media Digital), a subsidiary of Inflight Media Marketing International (IMM) has launched AirPMP at the last APEX exhibition held in Boston in September 2018. This is the second strategic Inflight digital solution launched from IMD this year. As a reminder, while AirSAS, its well-known in-flight ad-serving solution, places ads based on age, gender, passenger nationality or airline route, AirPMP matches airline offers and advertiser demands. IMD and IMM strategic target are clear: optimize the buying and selling of ad space. Moreover and good to know: real-time statistics on total impressions and click-through rate are updated at every aircraft takeoff and landing.